The Land Trust for Santa Barbara County relies heavily on volunteers to keep our preserves open to the public and the ecosystems healthy. The following is a listing of volunteer opportunities. We’d love for you to join one of our teams! Volunteer Work Days are held the 1st and 3rd full weekends of each month from 9:00 am-12:30 pm at the Arroyo Hondo Preserve. Tasks include habitat restoration and trail maintenance. Volunteers are needed to pull out invasive non-native weeds that threaten the sensitive habitats of the canyon and replant with native plants. Also, we are letting most of the ranch roads naturally convert to hiking trails, and hope to create a new loop trail through the backcountry. We then intend to connect these trails with the Los Padres National Forest. To RSVP, please contact John Warner, Preserve Manager at [email protected]. 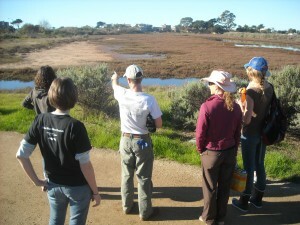 Docents are needed to lead individuals, school and community groups on interpretive hikes. Trained docents are asked to commit to 1 or 2 tours per month for one year. To become a docent or for more information, contact Volunteer Coordinator Sally Isaacson at (805) 260-2252 or email us. Volunteers are not currently needed at the Coronado Butterfly Preserve. Please contact the City of Goleta regarding their volunteer needs at the Goleta Monarch Butterfly Grove at (805)961-7500. The Carpinteria Salt Marsh Nature Park (run by the City of Carpinteria) needs volunteers to maintain the native habitats and for docents to lead individuals, school and community groups on interpretive walks. Contact Andrea Adams-Morden at (805) 684-8077 or email for more information. The Sedgwick Reserve needs docents to lead school and community groups on interpretive walks. Contact the Reserve at (805) 686-1941 for more information. Volunteers are needed for a variety of projects, including keeping the park clean and maintaining trails and the native habitats. Contact the City of Carpinteria at (805) 684-5405 or email Andrea. Note: These preserves are natural areas with hazards such as uneven trails, flowing creeks, ticks, rattlesnakes, poison oak and potential wildfires. Visitors are advised that the Land Trust for Santa Barbara County assumes no responsibility or liability for exposure to or harm from natural hazards.